This year’s Muster is April 22 at Cityview Bible Church (2441 County Road 112, Round Rock, TX 78665). A fajita dinner will be served at 6pm and the Muster Ceremony will begin at 7pm. While there are only a small number of meals left, there will be plenty of room for those attending the ceremony. Get more information and order dinner tickets (if available) at https://www.wcamc.com/muster/. Networking Lunch is Thursday April 18 at Cover 3 in Round Rock. Howdy Hour is Thursday April 25 at Whitestone Brewery in Cedar Park. Aggie Kids Night is Wednesday May 1 at Hat Creek Burger Company in Georgetown. Hope to see you at one of our events soon. We need your help for Big Event WilCo Edition. On March 30, WCAMC is helping ROCK (Ride On Center for Kids) prepare for their Annual Barn Dance. We will spend the morning helping in various ways from mending fences and painting to pulling weeds and washing windows. Come join us and show how the Aggie Spirit can be used to help others. Please sign up for the Big Event email list or follow our Facebook Event to stay up to date with the latest details. Networking Lunch is at Hat Creek Burger in Georgetown on Thursday March 21. Howdy Hour is at Alcove Cantina in Round a Rock on Thursday March 28. Aggie Kids Night in at Lucy’s Fried Chicken in Cedar Park on Wednesday April 3. Hope to see you at one of our events soon. The Big Event is the largest, one-day, student-run service project in the nation. Each spring, tens of thousands of Texas A&M students come together to say “Thank You” to the residents of Bryan and College Station. This year, WCAMC is taking part by helping ROCK (Ride On Center for Kids) prepare for their Annual Barn Dance. On March 30, we will spend the morning helping in various ways from mending fences and painting to pulling weeds and washing windows. Come join us and show how the Aggie Spirit can be used to help others. Due to April 21 being Easter Sunday, WCAMC Muster will be on Monday April 22. Muster will be at Cityview Bible Church (2441 County Road 112, Round Rock). Doors will open at 5:30pm, Dinner will be served at 6:00pm, and the Muster Program will begin at 7:00pm. Tickets for dinner are $25/person if ordered in advance and can be ordered here. As always, dinner is optional and there is no cost to attend the Muster Program. Aggie Night at the Dell Diamond will be May 11 this year. We will have hamburgers, hot dogs, chips, cookies, sodas, tea, water, and beer out by the pool and adjacent picnic area. Additionally, there will be drawings for door prizes. We are still finalizing some details, so keep an eye out for information about ordering tickets. Fish Fry will be June 7th at the Georgetown Community Center in San Gabriel Park. Aggie Kids Night is on March 6 at Salt Lick BBQ near the Dell Diamond. Reveille Breakfast in on March 7 at Rudy’s BBQ in Round Rock. Pizza Night is on March 14 at Double Dave’s Georgetown. Hope to see you at one of our events soon. Since 1992, the Williamson County A&M Foundation (WCAMF) has provided $436,700 in scholarships to assist 145 students from Williamson County attending Texas A&M University with money raised from Fish Fry and other efforts. If you know of a high school student that will be attending Texas A&M in the fall, encourage them to apply. The applications deadline is April 1. Recipients will be introduced at Muster on April 22. 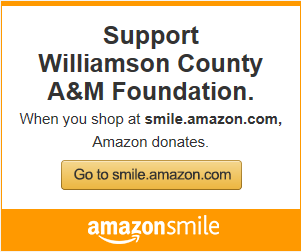 More information can be found on our scholarship page.The Williamson County A&M Club (WCAMC), with the help of members, recently began efforts to endow a scholarship through the Texas A&M Foundation to ensure scholarship opportunities for students from Williamson County well into the future. Thanks to the generous efforts of our members, WCAMC is about $5,000 away from completing our first $25,000 scholarship endowment. Follow our progress on our endowment page and learn how you can help. Following that lead, WCAMF is working to establish additional endowed scholarships and has established a matching program to partner with Williamson County Aggies on these scholarships. Contact us if you are interested in finding out more about our matching program. WCAMF is the 501(c)(3) non-profit arm of the WCAMC. As such, donations to WCAMF may be tax deductible while gifts to the WCAMC are not. Donations to our 12-12-12 Giving Campaign are made through WCAMF. Consult your tax advisor on the deductibility of donations. This week on Thursday February 21, our Networking Lunch is at Mandola’s Italian Restaurant (12100 W Parmer Ln in Cedar Park). Next week on Thursday February 28, our Howdy Hour is at Red’s Porch near the Outlet Mall in Round Rock. Our next Aggie Kids Night is on March 6 at Salt Lick BBQ near the Dell Diamond, and our next Reveille Breakfast in on March 7 at Rudy’s BBQ in Round Rock. Hope to see you at one of our events soon. We made several announcements at our Annual Meeting that I want to share with everyone. In addition to our great Thursday events including Reveille Breakfast, Pizza Night, Networking Lunch, and Howdy Hour, we are adding Aggie Kids Night on the first Wednesday each month. Aggie Kids Night is an opportunity for our Aggie Families with kids to get together and let the kids play as the adults (and possibly older children) visit. We have identified several locations with kid friendly entertainment options and are going to rotate locations monthly. On February 6, we will have a first Aggie Kids Night at Santa Catarina in Cedar Park (500 Cypress Creek Road #170, Cedar Park, TX 78613). Additionally, we made a slight change to Pizza Night and consolidated to the Georgetown Double Dave’s and discontinued the Cedar Park location. While the Georgetown location has become very popular, the Cedar Park location never really took off the way we had hoped. Also, mark your calendars. Aggie Night at the Dell Diamond will be earlier this year on May 11. Hopefully the weather will be a little cooler than in early August. We will share more information as it becomes available. We also eliminated membership dues. You never needed to pay dues in order to join us at any of our events and the money mostly ended up going towards funding scholarships. Instead, we are simply asking for donations towards those scholarships. To that end, we are launching our 12-12-12 fundraising campaign, with the goal of have just 12% of the Aggies in Williamson County give 12 dollars for 12 months. This month’s Networking Lunch will be at The Rock Sports Bar in Round Rock on January 17. Also, join us at Gumbo’s in Georgetown for our Howdy Hour/Annual Meeting on January 24 where we will have a few more announcements to share. Howdy Hour starts at 5:30 pm with the Annual Meeting beginning at 6:30 pm. 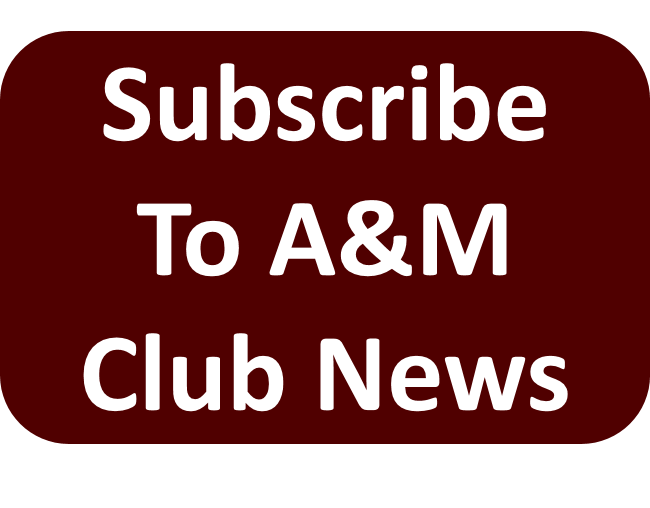 Following the lead of the Texas A&M main campus, the Williamson County A&M Club will be hosting the 2019 Aggie Muster on Monday, April 22, 2019, in the evening. We understand that moving the date of Muster is nothing to be taken lightly and appreciate everyone’s understanding in the matter. Keep an eye on your inbox and our facebook page for more details as we have them. We hope to see you all on April 22. The one-time date change for the campus Muster ceremony from its usual day of observance on San Jacinto Day, April 21, was prompted by the date coinciding with the Easter Sunday holiday, a time when traveling to and from campus may be difficult for members of the Texas A&M campus community and loved ones of deceased Aggies being honored. Aggie Muster Committee Chair Helena Shakesby, a Human Resource Management graduate student and member of the class of 2019, said the decision was made “with the input and support of a wide array of campus and community representatives.” Community representatives included Texas A&M representative student organizations (Student Senate, Class Councils, Corps of Cadets, Graduate & Professional Student Councils, etc. ), Texas A&M University administrators, The Association of Former Students, Class of 1969 representatives, former honored families, Transportation Services and Reed Arena support staff. We are bringing Bus12 back to Georgetown for the Christmas Stroll Parade THIS Saturday, December 1. There is still room for anyone that wants to join us on Bus12. 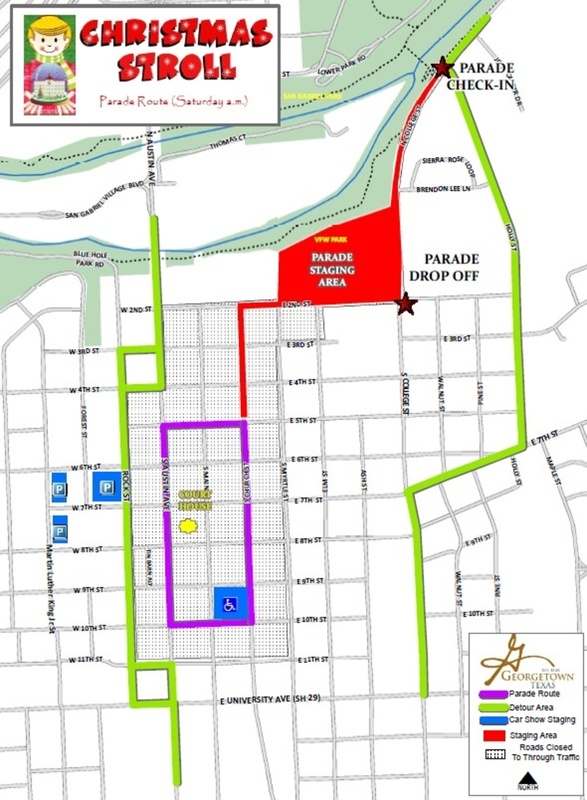 If you want to participate in the parade, we ask that you be in the “staging area” no later than 9am. RSVP’s are appreciated at GigEm@wcamc.com or call/text 5128872247. Alternatively, the parade begins at 10am, so line the streets and cheer us on. Due to logistical chalenges we will NOT be gathering for lunch at Hat Creek Burger Company in Georgetown after the parade as previously messaged. 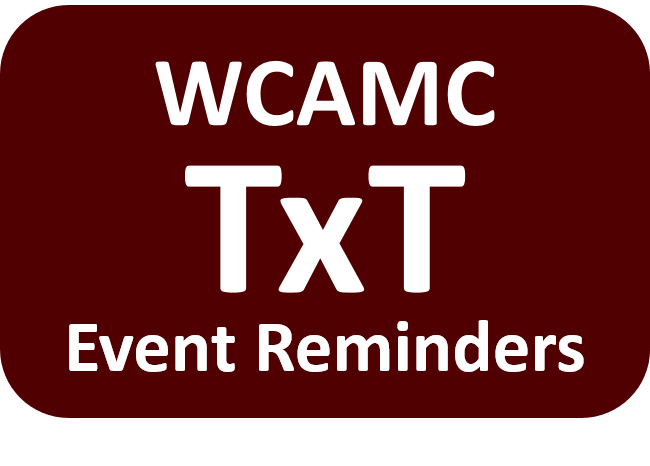 Text “ADD” to be subscribbed to our event text reminders that we send ~24 hours prior to each WilCo A&M Club event. Trouble seeing this email? View this email in your browser. Want to see all subscription options or receive fewer emails? Manage your subscriptions. I would like to unsubscribe from all Williamson County A&M Club email. This email was sent to uzsmxdzthw09qyx@wcamc.com. The Thursday November 15 Networking Lunch will be at Cover 2 on 183 in NW Austin. There will be no Howdy Hour on November 22 due to Thanksgiving. Join us at Mel’s Lone Star Lanes on Saturday November 17 at 6pm and Saturday November 24 as we watch the Ags BTHO UAB and LSU. We will be in the private room for both games. We are bringing Bus12 back to Georgetown for the Christmas Stroll Parade on December 1. We had such a great time at the Georgetown on the Square Parade that we were asked us to come back for Christmas. The parade begins at 10am, so line the streets and cheer us on. 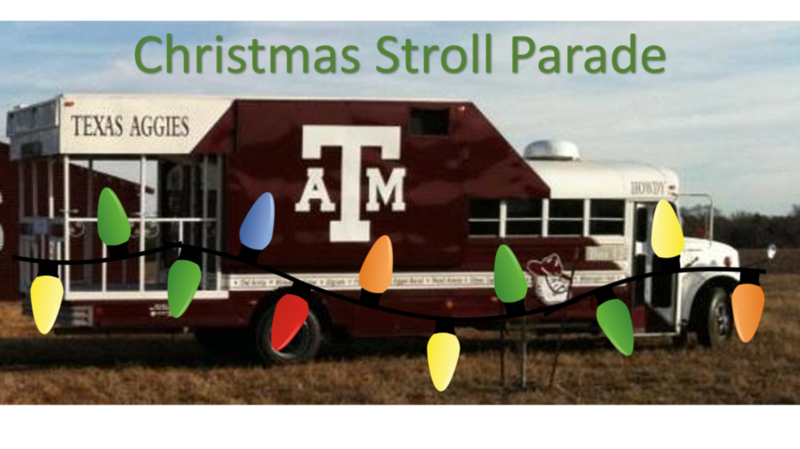 If you want to participate in the Christmas Stroll Parade riding or walking alongside Bus12, call/text (512) 887-2247 or email GigEm@wcamc.com. We will also be gathering for lunch at Hat Creek Burger Company in Georgetown after the parade. Reveille Breakfast is tomorrow morning at Rudy’s. As 2018 draws to a close, we won’t be having Howdy Hour in November and December due to conflicts with Thanksgiving and Christmas. However, there are a couple holiday events to add to your calendar. On December 1 at 10am, WCAMC will be participating in the Christmas Stroll Parade in Georgetown. Also, the Austin SEC Club hosts their annual Toys for Tots Toy Drive and Holdiay Party on December 11 at the 3rd Base on 183. More details to come as we get closer.